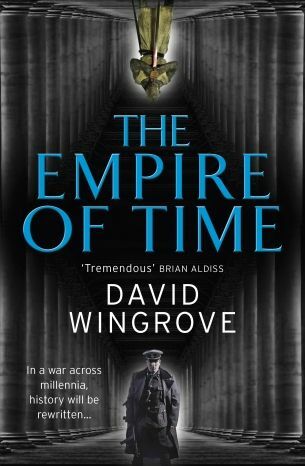 The Empire Of Time by David Wingrove book review . British author David Wingrove wrote the gargantuan Chung Kuo series, about a future dominated by China. His new book, the first in a trilogy, is comparably scaled. It’s about a time war, waged across millennia, fought between the post-apocalypse remnants of Germany and Russia. Fighters jump between the middle ages, World War II and doomed future civilisations, in a mind-boggling game of who can rewrite history fastest. The plot makes other time travel yarns look minnow-sized. Forget “let’s kill Hitler” – here, the Germans help Hitler win, to their own personal disgust. But that’s only one segment of the book, before the endless game moves on. The tone is sombre, with events mostly seen through the eyes of agent Otto, who’s had his fill of horrors through history. It’s immense fun for anyone who likes their SF writ really large, although Wingrove’s heady portrayal of four-dimensional warfare has its issues. Maybe it’s all consistent, but it’s hard to get a close grip on the temporal strategising, especially as it’s almost all shown from one side (the Germans). And while a romantic subplot, involving Otto and a medieval maiden, is enjoyable, it reduces the lady to a naked cipher. Both these issues may well be addressed in the sequels, but those of us bound to linear time have to take the story as we find it.